Fish is among the healthiest foods on this planet. Generally, all types of fish are good for us, as they are high in nutrients. 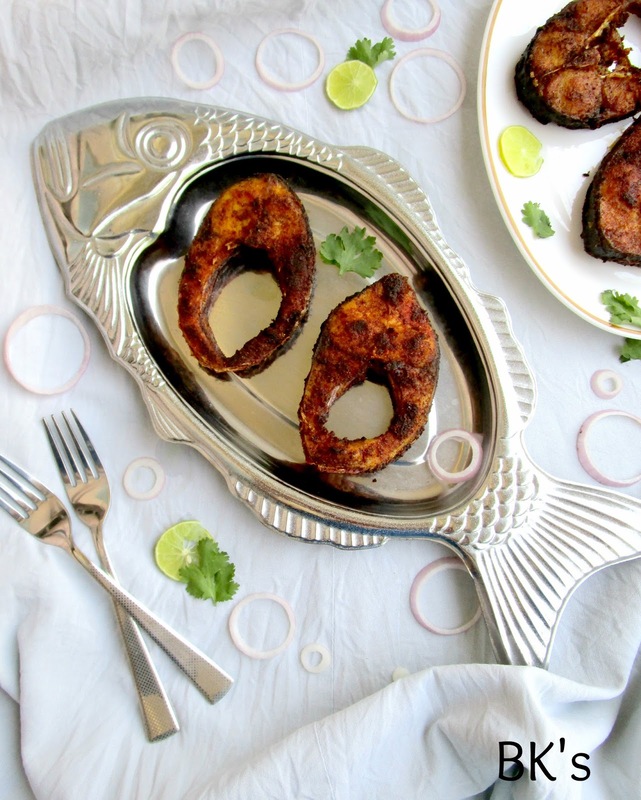 Today, I used Rohu, river fish in this recipe. 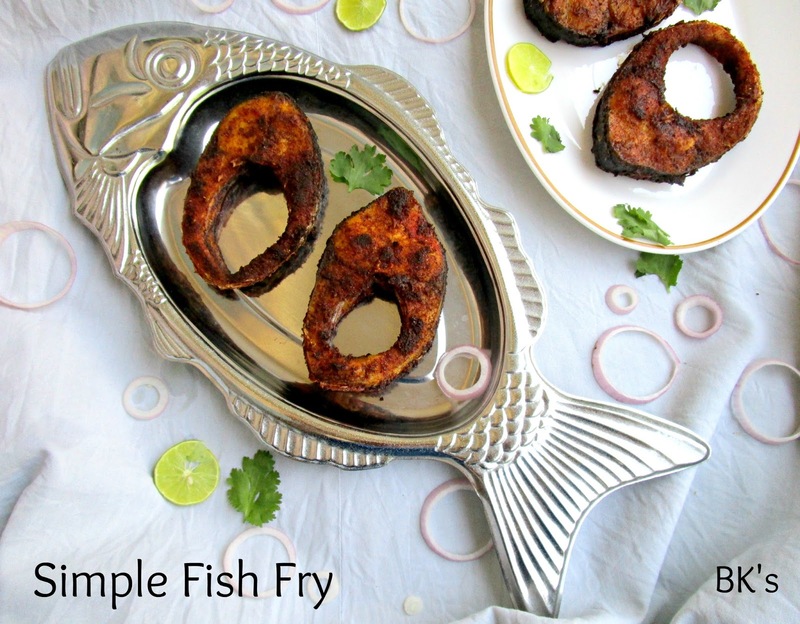 Fish fry can be made in many ways, this is the basic one of South India. 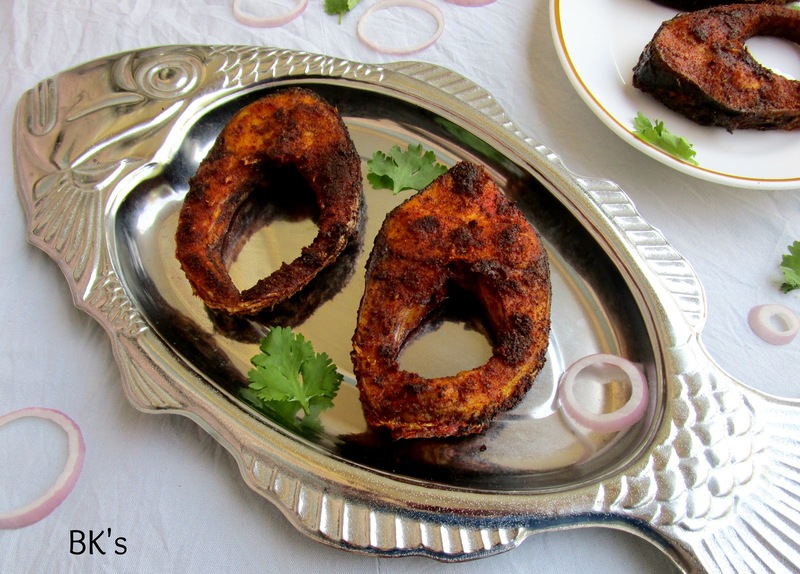 I like eating this fish fry with dal and rice. You could deep fry the fish or shallow fry it. Yes, there is no ginger- garlic paste, lemon juice or any special garam masala. When the fish is fresh, just the basic ingredients will do. 1. To the cleaned and washed fish pieces , add all the above ingredients, mix well and marinate for half an hour. 2. Fry the fish in a medium hot oil until done. mix everything well and marinate it for half an hour. After marination, fry the fish until done. 1. If your fish is not fresh, you could add ginger garlic paste, lemon juice to enhance its flavour. 2. 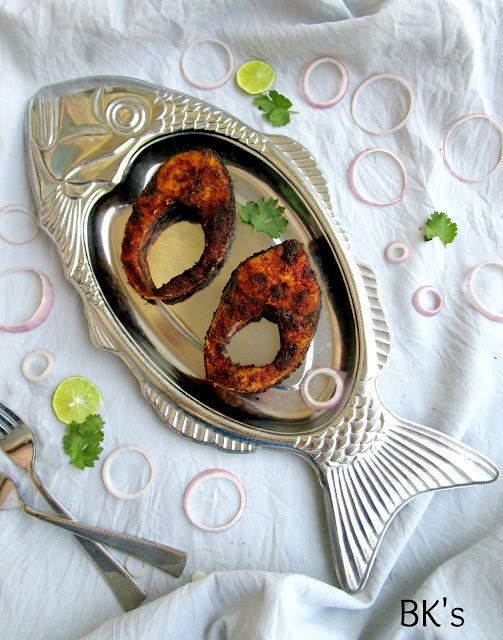 You could also add cornflour to this fish marination for crispy crust. Yes, it's homemade Eggless mayonnaise! 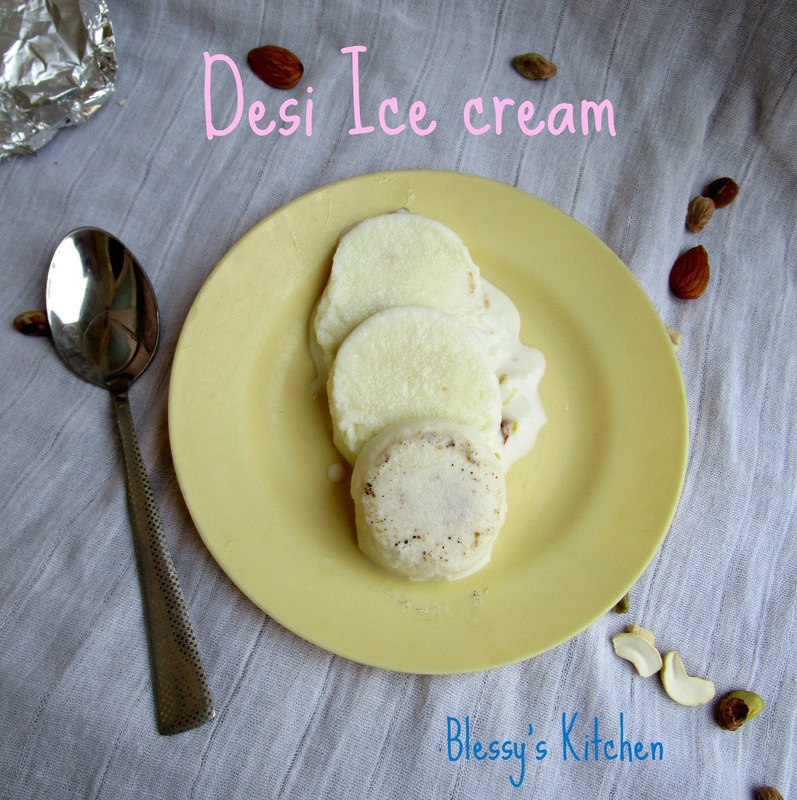 This is easy recipe which can be done under 5 minutes. Though I eat eggs, I chose eggless version of Mayo because I don't want to have that nasty feeling of me having raw eggs! Hence this recipe helped me. 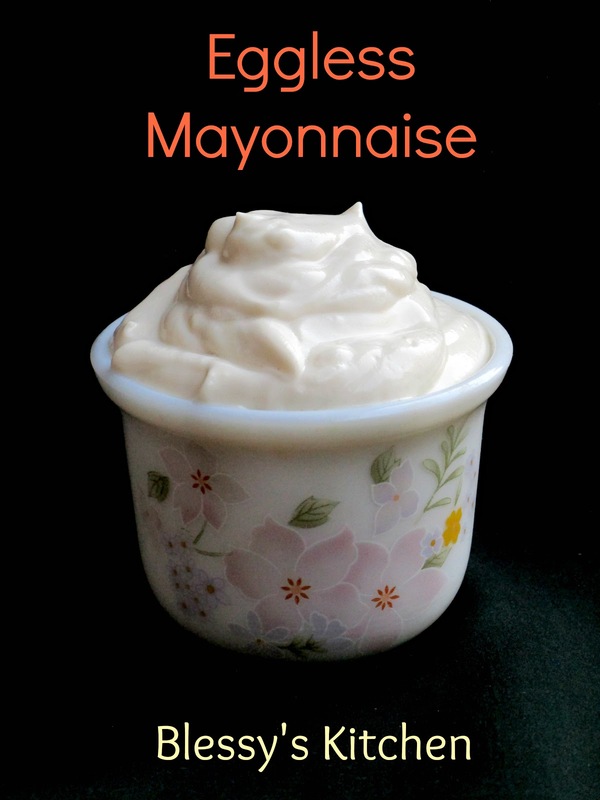 You could use this Mayo in the preparations of salads, sandwiches, dips etc. But, don't use this mayo in the preparation of cakes because this Mayo is egg free..
You could also add pepper powder to taste, which gives black tiny specs to your Mayo! 1. Make sure all the ingredients are at room temperature. 2. Add all the ingredients to a blender jar and blend until smooth and creamy. 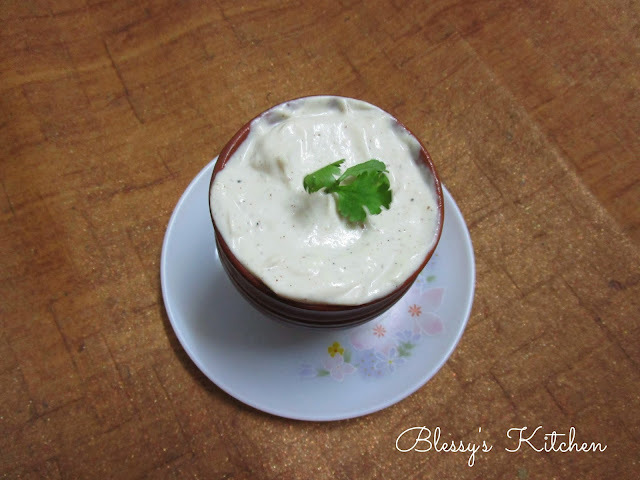 Delicious Eggless mayo is ready in minutes!! Japan has Mochi, Italy has Gelato, Saudi has Booza and India?? Yeah, we have the winsome Kulfi!!! 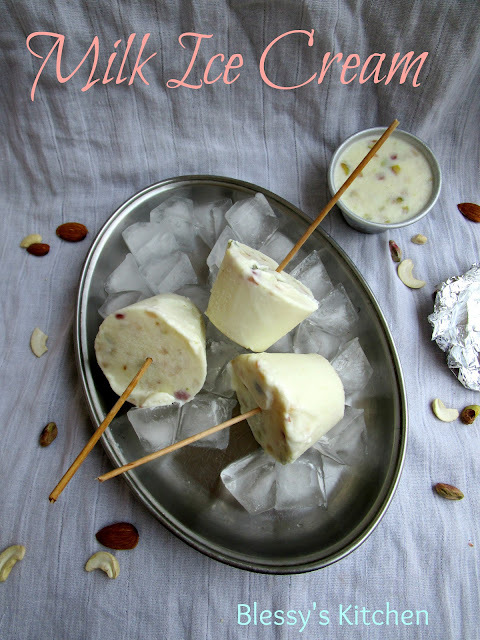 The dense frozen dessert sold on the streets here, some times on a stick or in earthenware pots and how could one forget relishing them in hot summers? Ahh! It made my summers enliven!! So, I decided to make Malai Kufi, the traditional way. 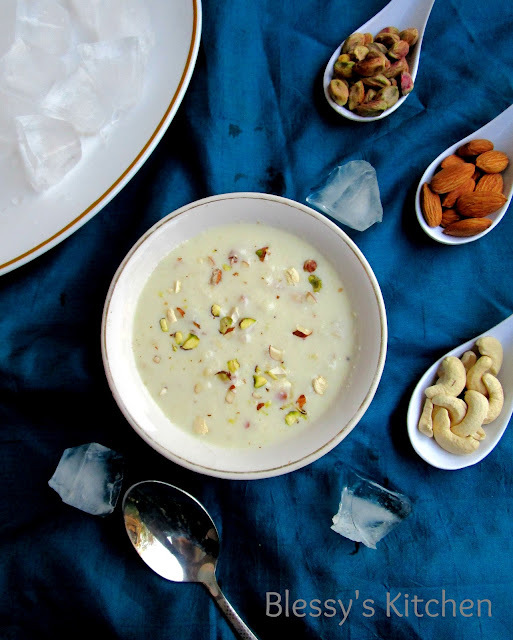 This includes slow process of condensing the whole milk until the desired consistency, followed by addition of nuts and flavorings and frozen until set. It has a distinctive taste due to caramelization of lactose and sugar during the cooking process. Kulfi's can be made in various flavours too. 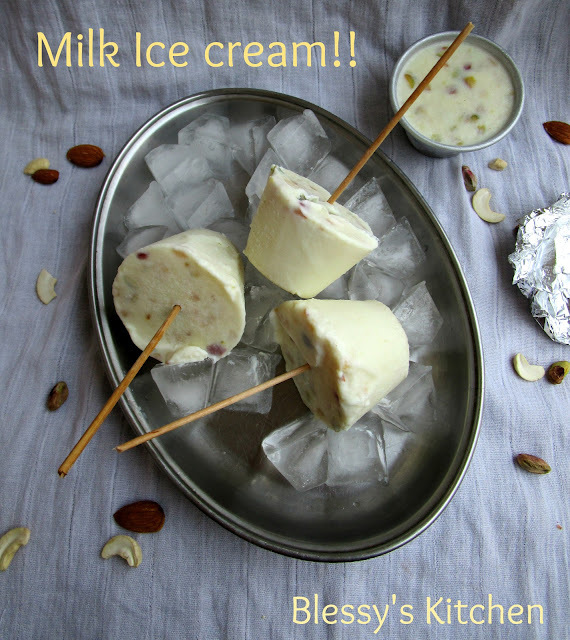 One could add extra few tablespoons of malai(cream) to the kulfi, also mawa/kova can be added for richness. 1. Bring the full cream milk to a boil. 3. Now, add the sugar to the reduced milk and continue to cook for about 5 minutes. 4. 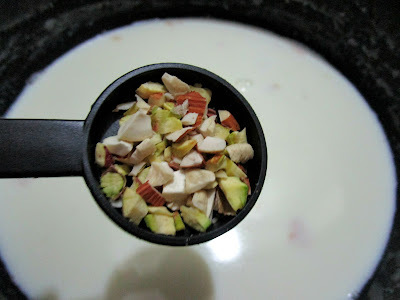 Add the nuts and the cardamom powder, switch off the flame and set it aside to cool completely. 5. 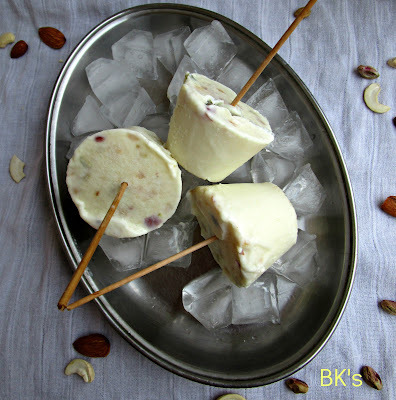 Now, pour the kulfi mixture into desired moulds, cover them and freeze until set. 6. 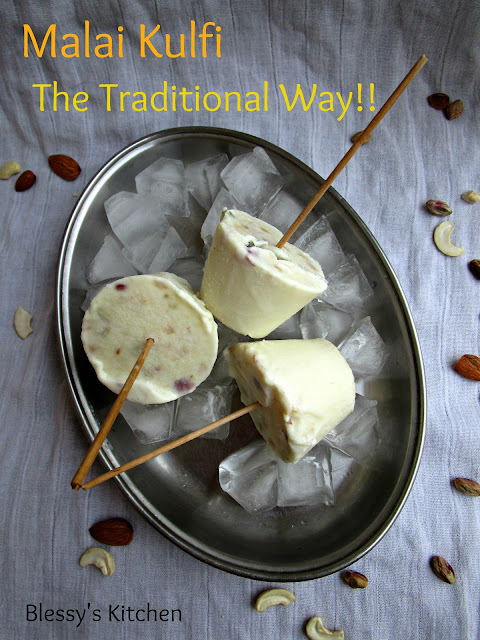 Insert your choice of kulfi stick before serving or cut the kulfi and serve. Bring the milk to a boil. Once it reaches boiling point, reduce the flame to medium and cook slowly. Keep stirring to not burn at the bottom. Also scrape the sides of the vessel and mix it in the milk for the even distribution of malai (cream). Cook until milk gets reduced to half of its volume. mix well and switch of the flame and set aside to cool. Insert your choice of kulfi stick before serving or cut the kulfi and serve. 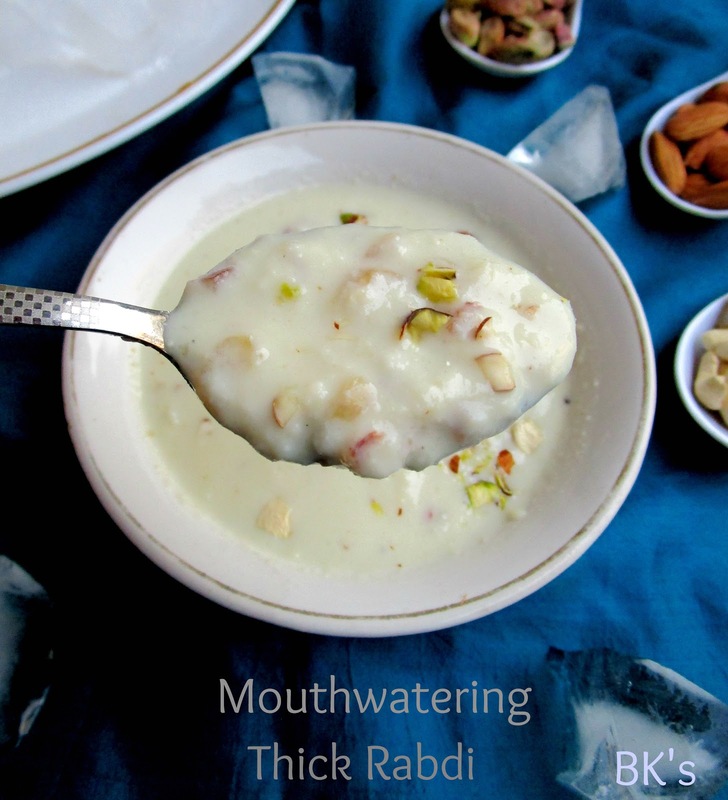 Rabdi is a North Indian sweet made by using whole milk and sugar. 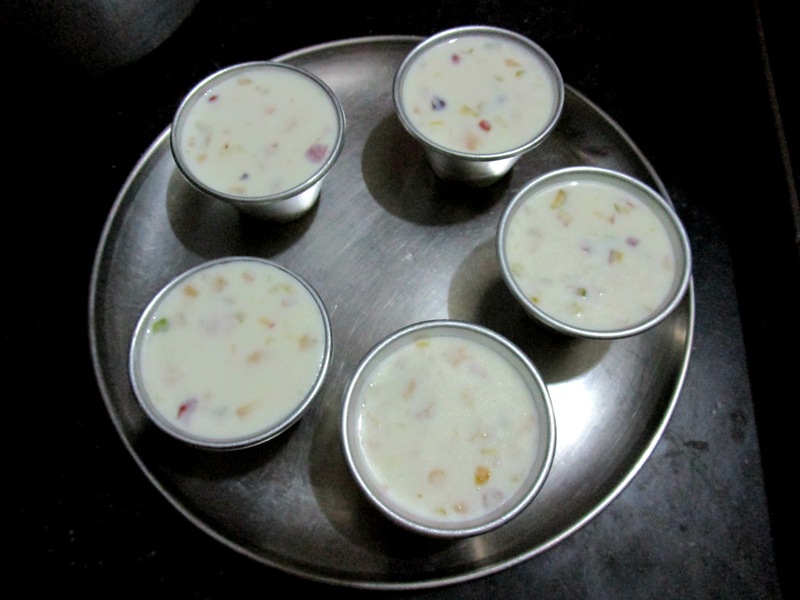 It is basically thickened milk and has cream (or) malai in it. It can be called as Indian condensed milk flavored with green cardamom, choice of nuts and saffron. Preparation of Rabdi is simple but it's time consuming. 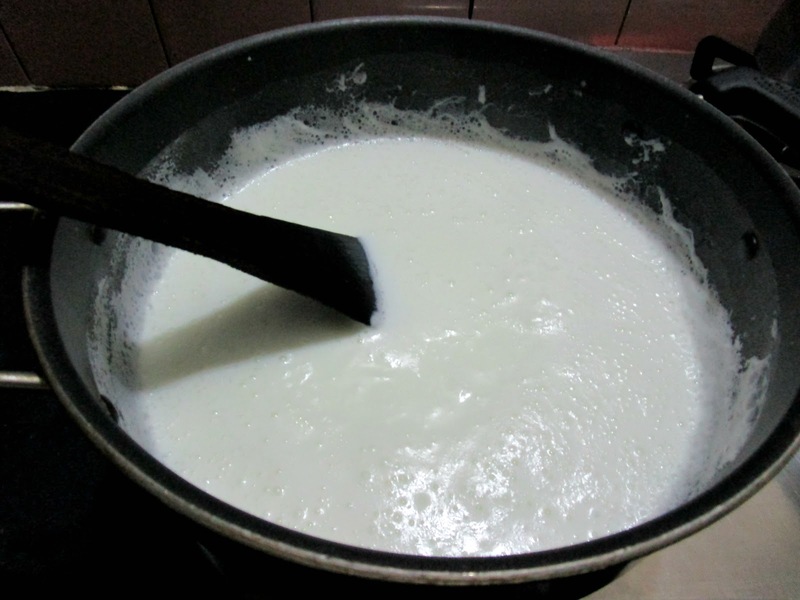 Today, I made, the traditional way which has chunks of milk solids, its thick , creamy and delicious. 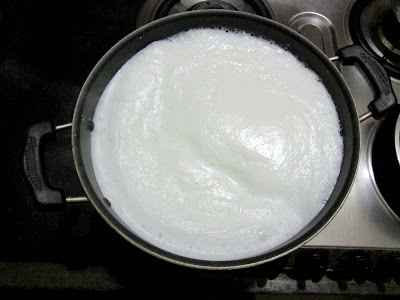 Make sure to use heavy bottom pan to avoid burning at the bottom and whole milk is a must. 1. Add the whole milk to the sauce pan and let it come to a boil. Once it starts boiling, simmer the flame and continue to boil and cook slowly. 2. 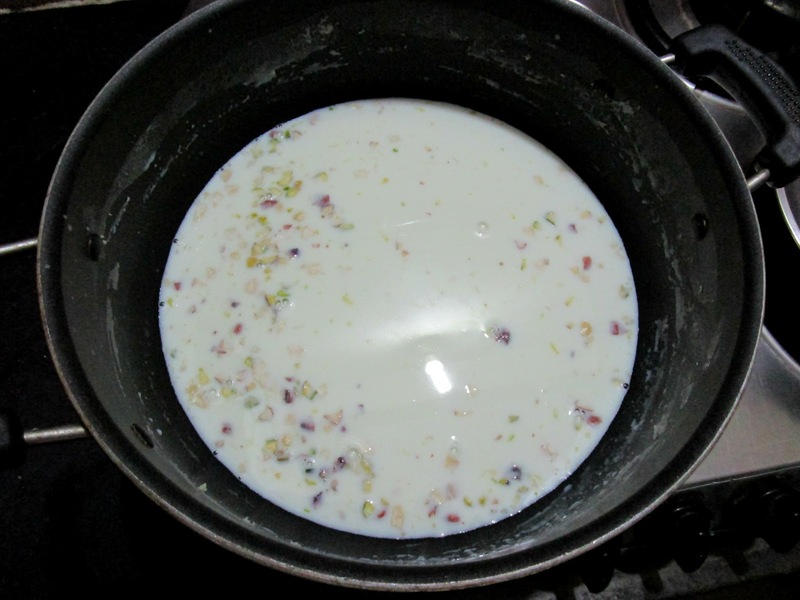 When the cream layer appears, shift it towards the edge of the pan and continue to cook the milk further. Repeat this process until the milk turns thick and it reduces to 1/4th of its original volume. 4. Scrape the cream from the sides of the sauce pan and mix well into the thickened milk. 5. Remove from fire and let it cool completely. Add the whole milk to the sauce pan and let it come to a boil. Once it starts boiling, simmer the flame and continue to boil and cook slowly. When the cream layer appears, shift it towards the edge of the pan and continue to cook the milk further. Repeat this process until the milk turns thick and it reduces to 1/4th of its original volume. 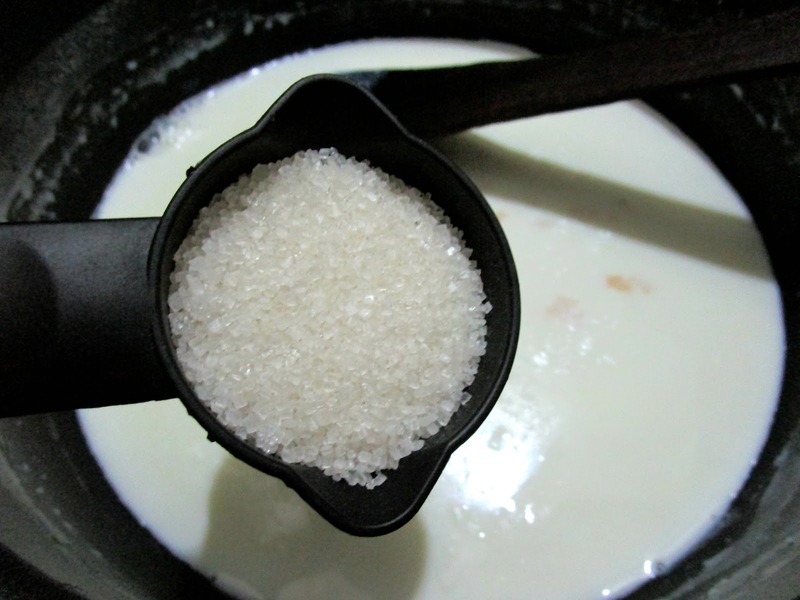 Add sugar to the reduced milk. 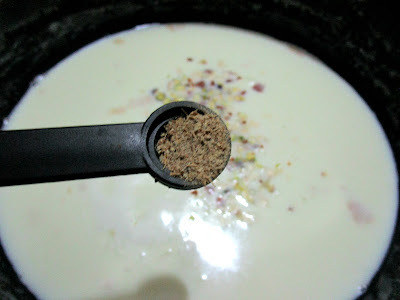 Add cardamom powder and continue to cook for the sugar to dissolve completely. You can add chopped nuts now or later. 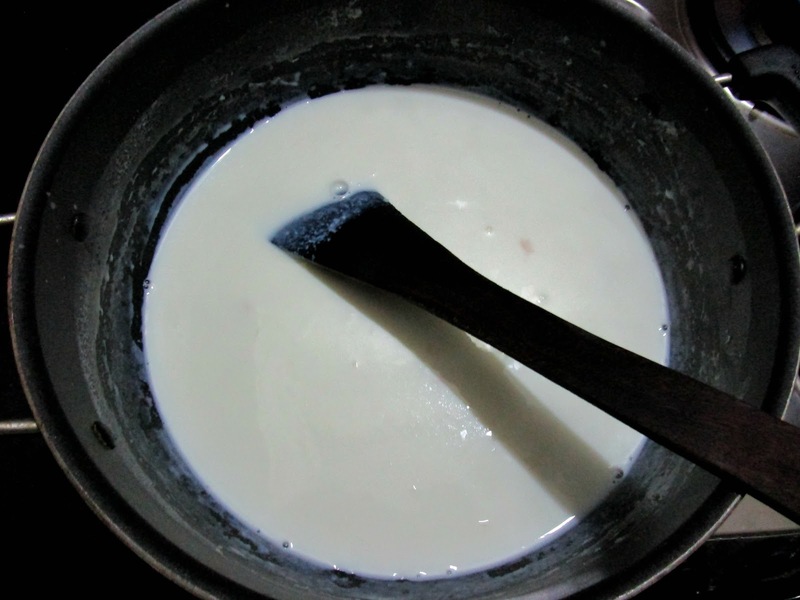 Scrape the cream from the sides of the sauce pan and mix well into the thickened milk. Remove from fire and let it cool completely. 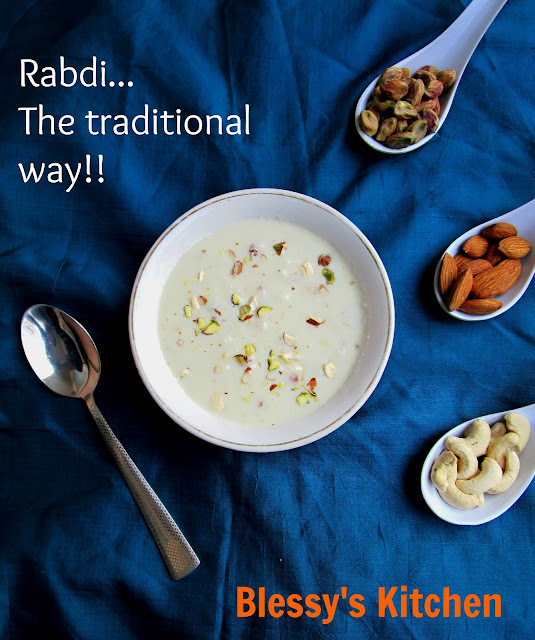 Add nuts to the Rabdi and serve chilled. 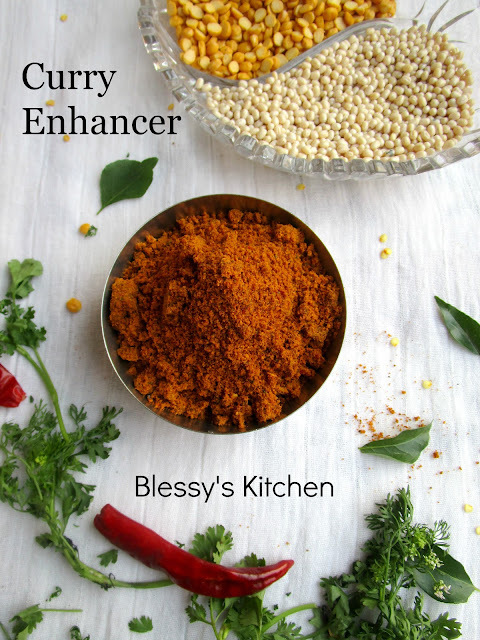 Make your veg curries full flavored by adding this powder. 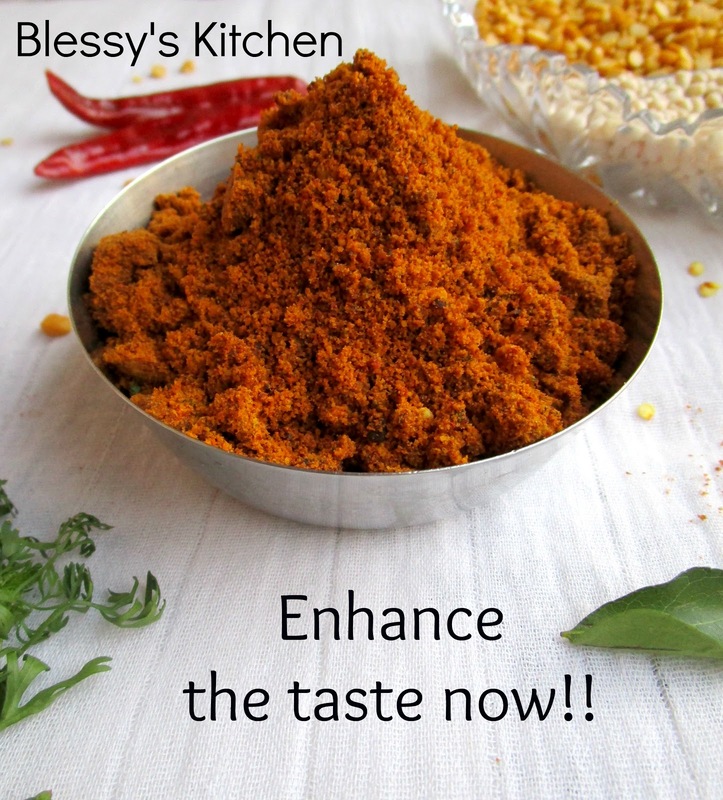 I've been using this powder in my curries since few months and I must say, it really does its job, its kinda cherry on the pudding, that final touch which adds depth to your dish. 1. Begin by dry roasting the first ingredients table i.e, grams and dry coconut each separately, until it turns golden brown in color. 2. Next, heat the oil in pan and roast the chillies on low flame until they turn bright red and crisp. Remove from oil and set aside. 3. Now roast the curry leaves with asafoetida until they turn crisp. 4. Grind all these ingredients into a fine powder, cool and store for future use.